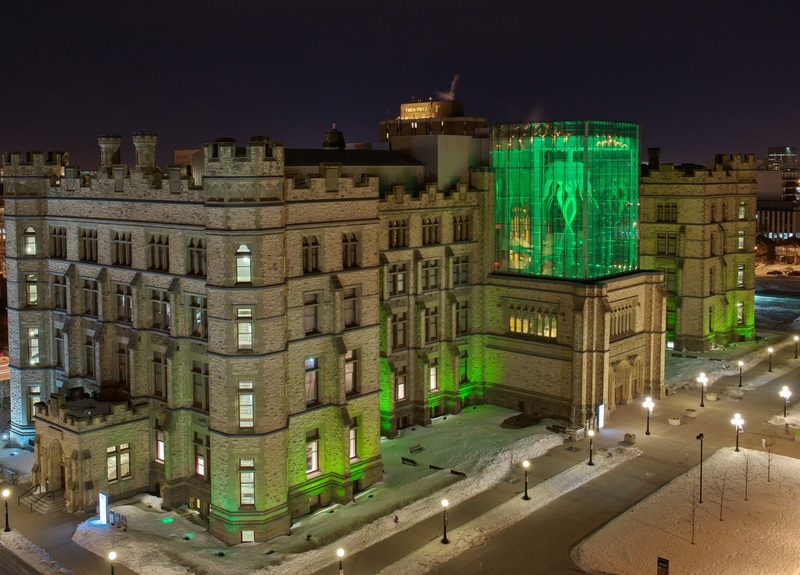 ‘Green light’ for St Patrick’s celebrations around the world! 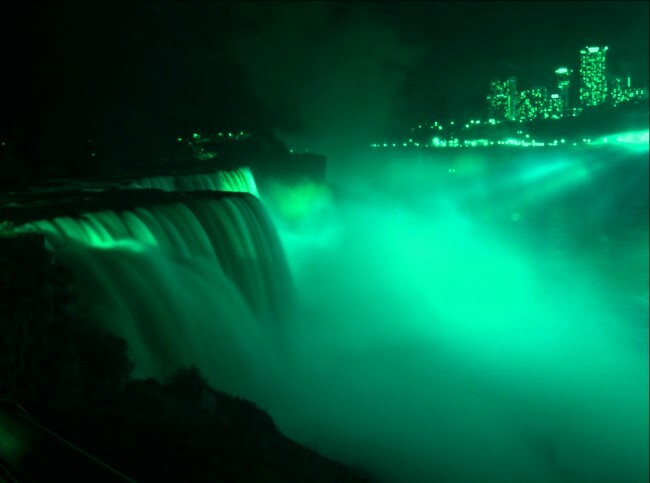 16 March 2017: Over 250 iconic landmarks and sites around the world will be illuminated green over the coming days – as part of Tourism Ireland’s 2017 Global Greening initiative to celebrate the island of Ireland and St Patrick. 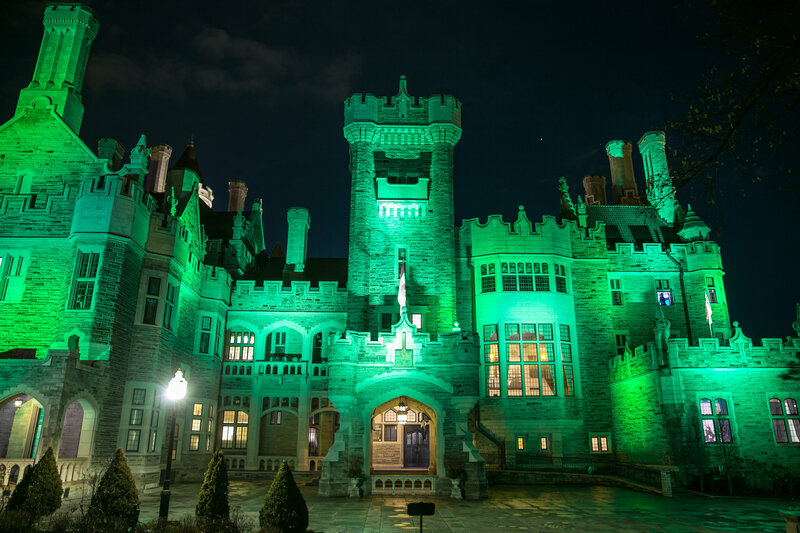 The annual initiative, now in its eighth year, which sees a host of major landmarks around the world turn green for St Patrick’s Day, has grown from strength to strength, with many new landmarks signing up to take part this year. Stadiums, statues, castles and towers will go green to celebrate our national day (17 March) with exciting additions for 2017 including the One World Trade Center in New York – the main building of the re-built World Trade Center in New York and the tallest building in the Western Hemisphere. Canadian landmarks going green this year include the Toronto Sign, Casa Loma, Whistler Ski Resort, Calgary Tower, Cabot Tower, The Big Fiddle, the Museum of Nature, the Big Nickel, the Distillery District, the Sails of Lights, the Futalognkosaurus (dinosaur) in the Royal Ontario Museum, Montreal City Hall, Complexe Desjardins, and La Tour McGill. Click Tourism Ireland’s Global Greenings for footage of the world turning green. Of course, the ‘greenings’ are just one part of the St Patrick’s Day celebrations. The place to be on 17th March is Ireland where there are two festivals which shouldn’t be missed. In Dublin, Ireland’s capital city, the ‘St Patrick’s Festival’ will last for four great days, taking in the weekend and running from 16-19 March. The city will be alive with music, film, arts, dance, culture, fun and even international rugby. Each year the festival has a different theme with this year’s ‘Ireland We Are’ giving the city a chance to showcase all that Ireland stands for today. Festival favourites include the world’s largest outdoor céilí, world-class museums hosting free workshops and guided historic walks including famous sites such as the Guinness Storehouse. The main event, the St Patrick’s Festival parade, is held on Friday 17 March in Dublin’s city centre. In Northern Ireland, the newly curated ‘Home of St Patrick Festival’ celebrates St Patrick, the man and the saint, as one of the world’s most inspiring and loved saints of all time. Taking place in the beautiful landscape of Counties Armagh and Down, which was once Patrick’s home, the festival will culminate on Sunday 19 March with ‘The Voice of the Irish’ closing concert in spectacular Newry Cathedral. The intimate and immersive nature of OOE’s small ship expedition cruises impacts travellers’ lives, while enhancing their appreciation for the Arctic and other Canadian destinations. Exploration of the Arctic is slowly becoming a journey of choice and a “Trip of a Lifetime” for Canadians and global travellers. OOE has been developing sustainable Arctic tourism for over a decade and are consistently innovative in creating itineraries taking visitors to some of the most unspoiled places on earth with programs that focus on education, science, history, arts & culture and exploration. OOE’s small ship adventures take travellers further afield providing access to archeological sites, remote Inuit communities and wildlife viewing opportunities few often experience. OOE’s 2018 cruise season continues to inspire, with the introduction of a ‘Circumpolar Art in the Arctic’ program that bridges the Norwegian High Arctic and the Canadian High Arctic through visual art. Internationally acclaimed visual artists include Cory Trepanier, David McEown, Bruce Pearson, Christopher Cran, wildlife documentary producer Karen Bass, internationally award winning photographer Daisy Gilardini, as well as polar scientists, historians and ambassadors of The Royal Canadian Geographical Society. A new and exceptional voyage for 2018 is the inaugural ‘Canada’s East Coast Golf Expedition.’ The seven-night expedition cruise invites guests to experience some of the best golf courses along Canada’s East Coast. Passengers enjoy the luxury of waking up every morning to a new course and the ease of boarding an expedition zodiac to take them ashore for their next round of golf. With additional expedition stops to Sable Island and Iles de Madeleine, this program offers unbeatable golf and cruising memories for golfers and non-golfing partners alike. From early July to the end of September, OOE operates several 12-night ‘Classic Northwest Passage’ voyages emphasizing early Arctic exploration. Along with an historical focus, guests travel to some of the last remaining great wilderness regions on the planet with sightings of polar bears, whales, and myriad bird species. The 11-night ‘Baffin Island – Jewel of the Arctic’ trip that was introduced in 2016 has already become one of the top selling voyages. The stunning nine-night ‘High Arctic Explorer’ voyage commences in Resolute, Nunavut, one of the most northern outposts in the Canadian Arctic. This trip offers the perfect blend of wildlife, history, culture and scenery. The 10-night ‘Labrador and Torngat Explorer’ cruise departs from the historic town of Louisbourg, Nova Scotia and explores two iconic National Parks, Gros Morne and Torngat Mountains. Exploring the rugged Newfoundland & Labrador coast provides an abundance of wildlife experiences that can be seen all the way up to Nunavut’s capital, Iqaluit. This itinerary is special and a gem of new offerings launched for the 2017 summer travel season. A number of early booking offers are in place for 2018 summer travel. On Canada’s East Coast Fins and Fiddles and Golf Expedition a complimentary pre-voyage hotel and US$100 shipboard bar credit is provided. For all other Arctic and Labrador voyages, early bookings benefit with a flight credit ranging from US$500 to US$1000. All offers expire May 31, 2017. ONE CLUB Loyalty Program members (past travellers with OOE) can apply their 10% loyalty savings to any current booking offers. OTTAWA, June 13, 2013 /CNW/ – Parks Canada reminds that admission will be free in all 44 national parks, 167 national historic sites, and four national marine conservation areas on Canada Day. To celebrate Canada Day, Canadians are invited to participate in an array of activities offered across the country. For details on celebrations across the country including activities involving Parks Canada in Canada’s Capital, please visit: www.pc.gc.ca/eng/voyage-travel/celebrations2013.aspx#Canada. 12 October, 2011 (Woody Point, Newfoundland) — Wild Women Expeditions (WWE), Canada’s largest all-women adventure travel company, enters its 22nd season with fun and unique adventures in every region of Canada. Wild Women Expeditions specializes in outdoor adventure travel exclusively within Canada. In 1991, the company started as an all-women canoe tripping company and over the last 20 years, Wild Women has expanded across Canada and is now offering kayak, flatwater and whitewater canoe, hiking, cycling, surfing and yoga adventures in eight provinces and territories. Yoga and art retreats compliment multi-sport adventures in a variety of outstanding wilderness destinations, including Vancouver Island’s Pacific Rim, the Rockies, Charlevoix Quebec, Northern Ontario, New Brunswick’s Bay of Fundy and Newfoundland’s Gros Morne National Park. In 2011, WWE broke new ground with the wildly popular “Wild Yoga Retreats” in Gros Morne, Newfoundland and Bay of Fundy, New Brunswick, combining a wellness-based program with outdoor adventure activities. WWE Director Jennifer Haddow said, “Women are looking to experience the wild in a holistic way, with other women who share their values and interests. Women’s-only travel resonates with more and more women who want more than a typical getaway vacation. They want to be part of a meaningful wilderness experience and they talk about the connections with other woman on our adventures as being as valuable as the experience of the destinations themselves”. From the beginning of June through to September 2012, many traditional favorites and some brand new expeditions are available. A greater number and range of trips have recently been added to meet the growing demand of women wanting to explore and experience the natural beauty of Canada’s wilderness. Recognized nationally and internationally for excellence in all-women wilderness trips, Wild Women Expeditions accommodates both the absolute beginner and the well-seasoned tripper. “WWE has had a steady climb, increasing our activities and business by almost 20 per cent in the last year, and is poised to grow even more in 2012.” said Haddow. “We are increasing our specialized trips, such as trips exclusively for lesbian and bisexual women, as well as building on trips for mothers and daughters and meeting more specific needs of the women’s travel community”. The complete 2012 schedule is available at www.wildwomenexp.com, or for more information 1-888-WWE-1222 . In 2011, WWE also launched a unique new blog ‘Women Going Wild’ (www.womengoingwild.ca) as a forum to share the stories of women about their empowerment and experience in Canada’s wilderness. Like Town Square Social Hub to Win 2 Harvest Ultimate Passes and lots more Prizes! Fredericton Tourism has launched its new “Town Square Social Hub” www.facebook.com/frederictontourism page and an exciting new contest that aims to create a unique social community appealing to both visitors and local residents alike. The “Meet in our Town Square Contest” offers new page fans the opportunity to win all-access passes to the City’s best festivals along with gifts certificates to some of the City’s top restaurants. “Our Town Square Social Hub will be a place to engage locals in a conversation about all that’s great in Fredericton. It’s where you’ll go to learn and talk about great festivals, attractions, events, concerts, shows, gallery openings and unique stories about our rich heritage. We want to create a space that reflects the cultural dynamism that emerging in Fredericton, a pool of local insiders conversation that visitors can dive into as they plan their visit,” says David Seabrook, manager of Fredericton Tourism. Fans joining Fredericton Tourism’s new “Town Square Social Hub” facebook page before April 30 will have a chance to win passes to all the City’s best events, including the Harvest Jazz and Blues Festival, the New Brunswick Highland Games, Maritime CountryFest, and the Summer Music Festival. The Grand Prize is a weekend package for the Harvest Jazz and Blues Festival (September 13-18). The package includes downtown hotel accommodation during the festival (three nights), A Deep Blues Experience Package that features two Ultimate all-access passes, backstage moments with a festival guide, and dinner with a Harvest headline artist. This package includes tickets to world-class artists like Rock & Roll Hall of Famer Gregg Allman, Johnny Lang, Matt Andersen the Pimps of Joytime. Other “Meet in Our Town Square Contest” prizes include passes to the New Brunswick Spirits Festival and a $50 gift certificate to the Blue door restaurant; passes to Summer music Festival and a $50 gift certificate to Bruno’s at the Delta Fredericton; passes to the Highland Games and a $50 gift certificate to the Lunar Rouge restaurant; and passes to Maritime CountryFest and a $50 gift certificate to the Garrison Ale House. Other prizes will be drawn when the Town Square Social Hub reaches 500, 1000, 1,500 and 2,000 member fans. These prizes include tickets to the Playhouse, edVentures learning vacation workshops, free bike rentals, and more. “Our goal is to create a community conversation that reflects the rich heritage and cultural dynamism of Fredericton. We want to reflect the excitement that exists here. We want to talk about great food, awesome events, kick around old stories that engage us in the place we live and provide a visitors with a sense of who we are,” says Seabrook. “As we get into tourism season, we want to encourage visitors to share their Fredericton vacation experiences with us. At Fredericton Tourism, we get lots of great feedback from visitors. We’d like them to share that with our community and other potential travelers,” adds Seabrook. There are 250 million people a month using Facebook. Fredericton Tourism says it will be an important part of its marketing strategy into the future. Aujourd’hui, Tourisme Fredericton lance sa nouvelle page Facebook Place publique, carrefour social (www.facebook.com/frederictontourism) ainsi qu’un passionnant concours visant à créer une communauté sociale unique qui intéressera aussi bien les résidents que les visiteurs. Le concours Bienvenue à la Place publique offrira aux adeptes de la nouvelle page la chance de gagner des laissez-passer complets pour les festivals de Fredericton ainsi que des chèques-cadeaux pour des restaurants parmi les meilleurs de la ville. « Place publique, carrefour social sera un endroit où les Frederictoniens et Frederictoniennes raconteront ce qu’ils trouvent de fantastique dans leur ville. Ils y parleront des festivals, des attractions, des événements, des concerts, des spectacles, des lancements et vernissages et d’histoires associées au riche patrimoine de leur ville. Nous voulons créer un espace pour mettre en valeur le dynamisme culturel qui règne Fredericton. 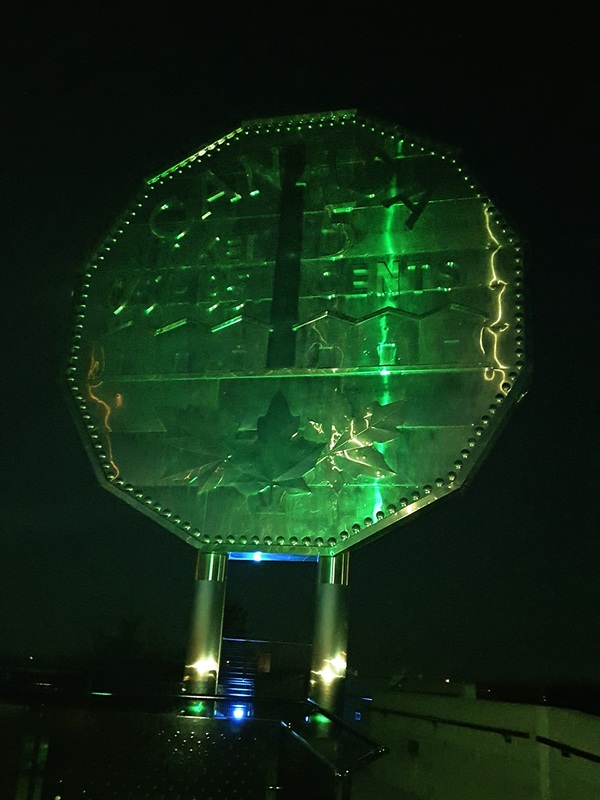 En fait, ce sera une sorte de discussion entre gens du coin que les visiteurs pourront consulter – et enrichir – lors de la planification de leur voyage », explique le gestionnaire de Tourisme Fredericton, David Seabrook. D’ailleurs, les gens qui iront sur la page Facebook de Tourisme Fredericton, Place publique, carrefour social, avant le 30 avril courront la chance de gagner des laissez-passer pour les événements les plus populaires en ville, entre autres le festival Harvest Jazz and Blues, les Jeux Highland du Nouveau-Brunswick, le Festival country des Maritimes, et le Festival de musique. Le grand prix, une fin de semaine au festival Harvest Jazz and Blues (13-18 sept.), comprend trois nuitées dans un hôtel du centre-ville (pendant le festival) et le forfait Jazz et blues au max! Ce forfait englobe deux laissez-passer complets, une visite en coulisses avec un guide du festival et un souper en compagnie d’un artiste en vedette au festival ainsi que des billets pour des spectacles d’artistes aussi renommés que Gregg Allman, membre du panthéon du rock and roll, Johnny Lang, Matt Andersen et the Pimps of Joytime. Le concours Bienvenue à la Place publique donnera la chance de gagner d’autres prix, notamment des billets pour le Festival annuel des spiritueux du Nouveau-Brunswick avec chèque-cadeau de 50 $ échangeable au restaurant Blue door, des laissez-passer pour de musique d’été et le Festival avec chèque-cadeaux de 50 $ pour le Bruno’s (Delta Fredericton), des laissez-passer pour les Jeux Highland du Nouveau-Brunswick avec chèque-cadeaux de 50 $ échangeable au restaurant The Lunar Rouge et des billets pour le Festival country des Maritimes avec chèque-cadeaux de 50 $ pour le Garrison District Ale House. D’autres prix – billets pour le Playhouse, ateliers de vacances éducatives éducAventures, location gratuite de vélos, etc. – seront tirés quand la page Place publique, carrefour social atteindra 500, 1000, 1500, puis 2000 adeptes. « Notre cherchons avant tout à susciter une conversation communautaire à l’image du riche patrimoine et du dynamisme culturel de Fredericton. Nous voulons répandre la vitalité de notre ville en parlant des bonnes tables, des événements fantastiques, des histoires d’autrefois qui renforcent notre attachement pour cet endroit où nous vivons… bref, faire comprendre aux visiteurs qui nous sommes », indique M. Seabrook. « Comme la saison touristique approche, nous voulons encourager les visiteurs à nous raconter leurs vacances chez nous. Les visiteurs font beaucoup de commentaires enthousiastes à Tourisme Fredericton… ce serait bien que les gens d’ici et d’ailleurs puissent les lire aussi », ajoute M. Seabrook. Chaque mois, 250 millions de gens vont sur Facebook. Tourisme Fredericton indique que ce site sera désormais un élément important de sa stratégie marketing. (TIAC) this week in Saint John . existing market, product or process. unique” says David Seabrook, manager of Fredericton Tourism. in Atlantic Canada and second largest in Canada . of New Brunswick ’s finest and most engaging artists and artisans. said Stacey Russell, Travel Media – Fredericton Tourism. won more than one Tourism Excellence and Innovation award in a single year.